23 – Hampstead Moonlight Club, London, UK. 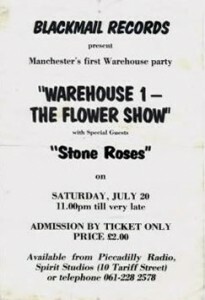 “the first Roses gig was in the Moonlight in Hampstead, an anti-heroin benefit that Pete Townsend put on” Ian Brown. 21 – Labour Club, Exeter, UK. 22 – Ad-Lib Club, Kensington, UK. 04 – The Greyhound, Fulham, UK. 13 – Piccadilly Radio Session, Manchester, UK. 19 – The Marquee, London, UK. 08 – Dingwalls, London, UK. 20 – The Maze, Nottingham, UK. 29 – Clouds, Preston, UK. 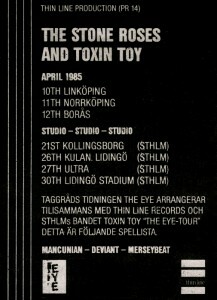 10 – Bing Bang Club, Linköping, Sweden. 11 – Olympia, Norrköping, Sweden. 25 – Kolingsborg, Stockholm, Sweden (support). 26 – Lidingö Stad, nr Stockholm, Sweden (support). 30 – Lidingö Stad, nr Stockholm, Sweden (support). 24 – The Gallery, Manchester, UK (support). 04 – Greydon Underground, Croydon, London, UK (support). 20 – Warehouse I, Flower Show, Manchester, UK. 10 – The Marquee Club, London, UK. 15 – The Hacienda, Manchester, UK. 24 – The Marquee Club, London, UK. 27 – The Hacienda, Manchester, UK (support). 26 – The Riverside, London, UK (support). 02 – Manchester University, Manchester, UK. 30 – Warehouse Take 2, Manchester, UK. 05 – King George’s Hall, Blackburn, UK. 25 – Warwick University, Coventry, UK. 10 – Manchester University, Manchester, UK. 24 – Warwick University, Coventry, UK. 31 – McOnagles, Dublin, Ireland. 6 – The Warehouse, Leeds, UK. 5 – The Three Crows, London, UK. 11 – Mardis Gras, Liverpool, UK. 13 – Bluebird Club, Barrow-in-Furness, UK. 02 – Manchester University, UK. 30 – The International I, Manchester, UK. 3 – Take Two, Sheffield, UK. 17 – Planet X, Liverpool, UK. 11 – Larks In The Park, Sefton Park, Liverpool, UK. 23 – Dingwalls, London, UK. 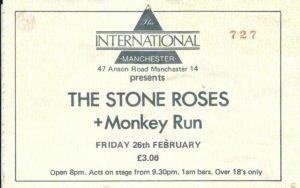 26 – International 1, Manchester, UK. 14 – International 1, Manchester, UK. 26 – Citadel, St Helens, UK. 29 – Olives, Chester, UK. 02 – London School of Economics. 11 – The Venue, Edinburgh, UK. 30 – Hacienda, Manchester, UK. 17 – Legends, Warrington, UK. 20 – Sheffield University, Sheffield, UK. 23 – Middlesex Polytechnic, UK. 28 – Escape Club, Brighton, UK. 01 – Club Rio, Bradford, UK. 02 – The Venue, Cardiff, UK. 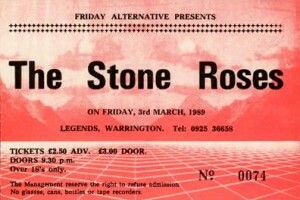 03 – Legends, Warrington, UK. 28 – South Parade Pier, Portsmouth, UK. 04 – Liverpool Polytechnic, UK. 05 – Queen’s Hall, Widnes, UK. 06 – International 2, Manchester, UK. 08 – Warehouse, Leeds, UK. 11 – Trent Polytechnic, Nottingham, UK. 12 – JBs, Dudley, UK. 13 – Angel Centre, Tunbridge, UK. 17 – Edwards No 8, Birmingham, UK. 19 – Aberystwyth University, Aberystwyth, UK. 22 – Camden Dingwalls, London, UK. 30 – Guildhall Foyer, Preston, UK. 06 – Majestic, Reading, UK. 08 – Lancaster University, Lancaster, UK. 21 – Venue, Edinburgh, UK. 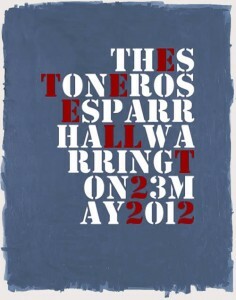 23 – Town Hall, Middlesbrough, UK. 24 – Roadmenders, Northampton, UK. 25 – Norwich Arts Centre, Norwich, UK. 26 – Bierkeller, Bristol, UK. 27 – Civic Hall, Stratford-On-Avon, UK. 30 – Leeds Polytechnic, Leeds, UK. 27 – Riverside, Newcastle, UK. 03 – Club Logo, Hamburg, Germany. 04 – Luxor Club, Cologne, Germany. 10 – Melkweg, Amsterdam, Holland. 12 – Les Inrockuptibles Festival, Paris, France. 24 – Kan-1 Hoken Hall, Tokyo, Japan. 25 – Mainichi Hall, Osaka, Japan. 27 – Nihon Seinenkan, Tokyo, Japan. 18 – Alexandra Palace, London, UK. 21 – The Late Show, BBC2. London, UK. 23 – Top Of The Pops BBC1. London, UK. 27 – Spike Island, near Widnes, UK. 03 – Feria De Nimes Festival, Spain (Cancelled). 07 – Maysfield Leisure Centre, Belfast, Northern Ireland. 09 – Glasgow Green, Glasgow, UK. 21 – Chicago, USA. (Cancelled). 22 – New York, USA. (Cancelled). 29 – Hollywood High School Gymnasium, California, USA (Cancelled). 19 – Rockefeller, Oslo, Norway. 20 – Palladium, Stockholm, Sweden. 24 – Docks, Hamburg, Germany. 25 – Metropol, Berlin, Germany. 26 – Paradiso, Amsterdam, Holland. 27 – La Luna, Brussels, Belgium. 29 – E-Werk, Cologne, Germany. 03 – Art Palladium, Rome, Italy. 05 – Le Bikini, Toulouse, France. 11 – Elysee Montmartre, Paris, France. 14 – Midtown Music Festival, Atlanta, USA. 17 – Gaston Hall, Washington DC, USA. 18 – Marine Terminals, Toronto, Canada. 20 – Manhattan Ballroom, New York, USA. 21 – Avalon Club, Boston, USA. 22 – Webster Hall, New York, USA. 24 – The Trocadero, Philadelphia, USA. 26 – Riverport Amphitheatre (Pointfest 3), St Louis, USA. 27 – World Music Theatre, Chicago, USA. 29 – Palladium, Los Angeles, USA. 31 – Fillmore, San Francisco, USA. 30 – Lollipop Festival, Stockholm, Sweden. 31 – Tullikamari Club, Tampere, Finland. 01 – Tavastia Club, Helsinki, Finland. 02 – Tavastia Club, Helsinki, Finland. 05 – Cork, Ireland (Feile Festival). 11 – Club Citta’, Kawasaki, Japan. 12 – Nippon Budokan, Tokyo, Japan. 13 – Nippon Budokan, Tokyo, Japan. 15 – Convention Theater, Okinawa, Japan. 17 – IMP Hall, Osaka, Japan. 18 – Century Hall, Nagoya, Japan. 20 – Yuubin Chokin Hall, Hiroshima, Japan. 21 – Sun Palace Hall, Fukuoka, Japan. 24 – IMP Hall, Osaka, Japan. 25 – IMP Hall, Osaka, Japan. 27 – Factory Hall, Sapporo, Japan. 28 – Club Citta’, Kawasaki, Japan. 01 – Festival Hall, Brisbane, Austrailia. 02 – The Enmore Theatre, Sydney, Austrailia. 03 – The Enmore Theatre, Sydney, Austrailia. 05 – The Metro, Melbourne, Austrailia. 07 – The Thebarton Theatre, Adelaide, Austrailia. 08 – The Metropolis, Perth, Austrailia. 09 – The Metropolis, Perth, Austrailia. 28 – Spa Theatre, Bridlington, UK. 30 – Civic Hall, Wolverhampton, UK. 01 – Corn Exchange, Cambridge, UK. 02 – Brighton Centre, Brighton, UK. 04 – Newport Centre, Newport, UK. 05 – Exeter University, Exeter , UK. 11 – Rivermead, Reading, UK. 12 – University of East Anglia, Norwich, UK. 17 – Music Hall, Aberdeen, UK. 19 – Barrowlands, Glasgow, UK. 20 – Barrowlands, Glasgow, UK. 10 – Festival Vilar de Mouros, Portugal. 11 – Skanderborg Festival, Denmark. 23 – Lowlands Festival, Holland (cancelled). 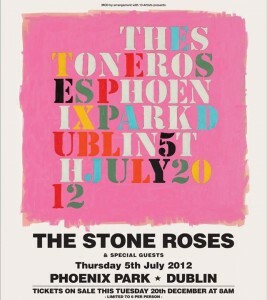 Pingback: Stone Roses Readying New Album for 2013?